At least 8 deaths have been linked to the severe weather hitting the Midwest right now. 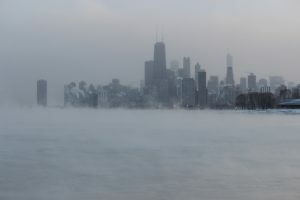 A man was struck and killed by a snowplow in the Chicago area, a snow- and ice-covered road killed an Indiana couple when their SUV spun out, and in Milwaukee, a man had been found frozen to death in a garage. Iowa police found an unresponsive 18-year-old, a pre-med student, outside of University of Iowa. He later died at a hospital. Officials say the death was related to weather, and at the time the wind chill was 51 below zero. In Detroit, Michigan a man was found in front of a neighbor’s home. Officials are asking people to stay inside if they can, and if you see someone in need, to act. More than 4,800 flights have been cancelled, schools are closed, and deliveries have been suspended until further notice.